This photograph below was taken by photographer Herb Scharfman at the end of the Walcott-Rocky Marciano won the heavyweight championship. 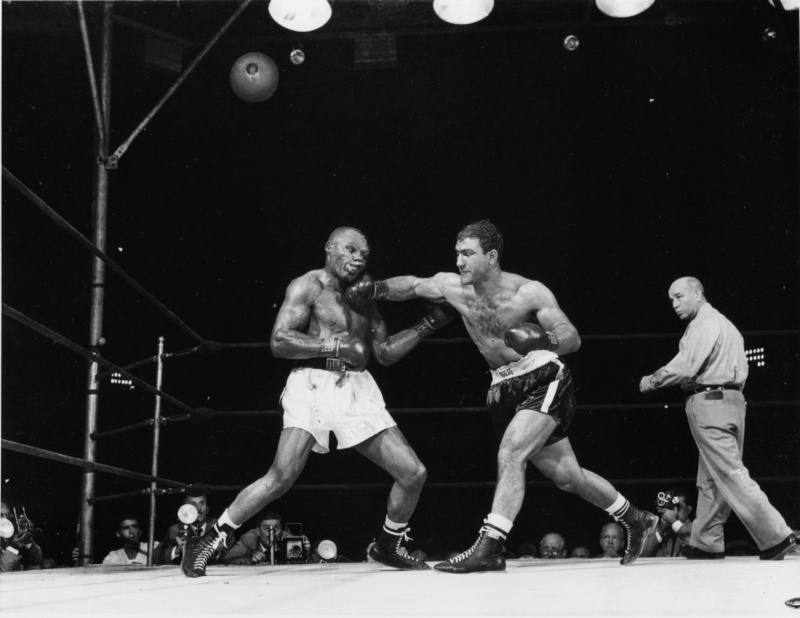 Marciano would become the only undefeated heavyweight champion in history (49-0). In my opinion, this is one of the best photographs ever. After you get beyond the focal point of the picture--Walcott's face absorbing Marciano's right cross--look at the rest of the picture carefully. In composition, lighting, detail, musculature, drama--it's, well, Michelangelo with a 10-inch view camera. I receive a fair number of requests for copies of this print. I'm afraid this is impossible. 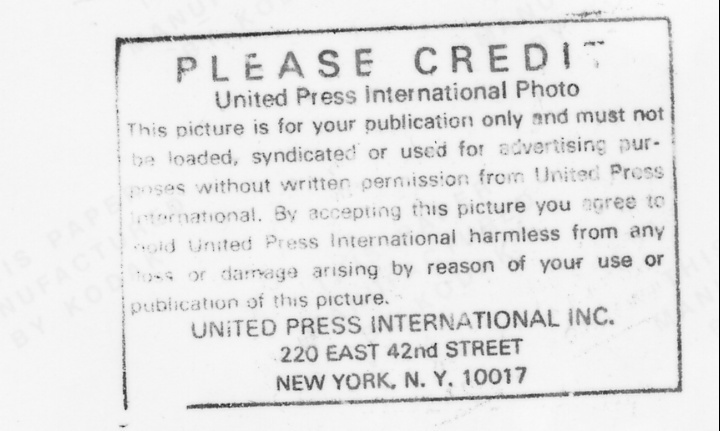 I purchased publication rights from UPI many years ago--in the late 70's or early 80's. Here's a copy of the UPI publication license on the back of the photo. Notice that I do not have distribution rights, so I'm unable to sell (or even give away) copies of the print. When the web came along, UPI and other media companies probably excluded it explicitly from standard licensing agreements (although I'm told that a web site is a "publication" under US copyright law). This would explain why I was unable to find another copy of this famous photo on the web. As an author of several books myself, I take licensing agreements seriously; I therefore prohibit the downloading of any unlicensed use of the image(s) on this page. Furthermore, if anyone feels I'm not entitled to display this image please complain through UPI. By the way, while this fight was going on, Richard Nixon was giving his famous "Checkers" speech. I'm afraid that scans at higher resolutions reveal the dirt and scratches that the print has accumulated over the years, even though it's been framed most of the time.